Now a major motion picture starring Jessica Chastain and Daniel Brühl, Diane Ackerman's The Zookeeper's Wife is based on a remarkable true story of bravery and sanctuary during World War II. Perfect for fans of Lion and Hidden Figures. 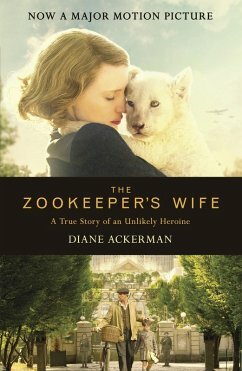 Written with the narrative drive and emotional punch of a novel, The Zookeeper's Wife is a remarkable true story. It shows us the human and personal impact of war - of life in the Warsaw Ghetto, of fighting in the anti-Nazi resistance. But more than anything it is a story of decency and sacrifice triumphing over terror and oppression. Diane Ackerman, geboren 1948 in Illinois, Studium der Geisteswissenschaften. Zahlreiche Buchveröffentlichungen (auch Lyrik und Gedichte) sowie journalistische Arbeiten.Sie lebt mit ihrer Familie in Ithaca, NY.